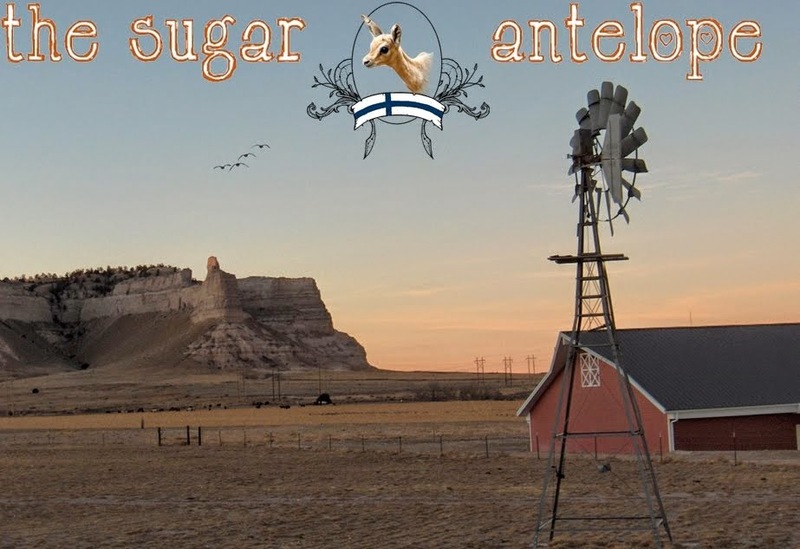 The Sugar Antelope: U.S Presidential Elections: who do you side with? 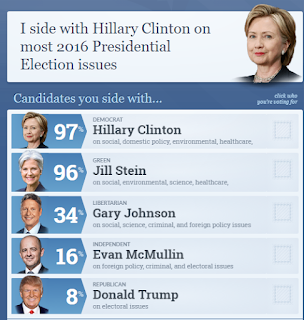 U.S Presidential Elections: who do you side with? 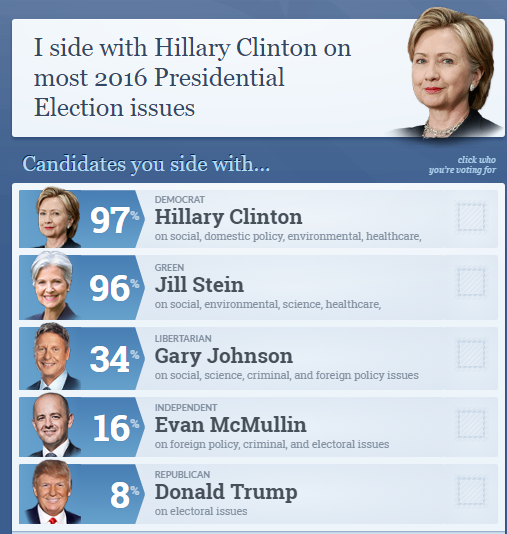 Tein vaalivuonna 2012 isidewith.com sivuston testin ja sain ehdokkaakseni Jill Steinin. Ehdokkaat olivat kohdallani yllattaen tasavakisia vuonna 2012, jopa republikaanien ehdokas oli aika korkealla prosenttimaaralla mukana. Eipa ole enaa. Kylla ovat republikaanit kauaksi tippuneet ja kylla se vaan niin on, etta paljon parjattu Hilary Clinton on kanssani todella samoilla linjoilla. "I will stick to my claim that Reps represent the best interests of only a small minority. 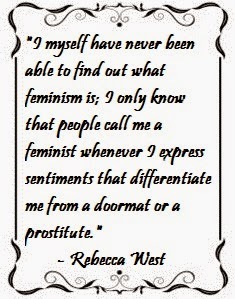 They don't represent the best interests of women, whom are about half the population. They don't represent the best interest of people with low income, the ones that might at some point of their lives need government assistance. And since almost 60% of Americans will spend at least one year below the poverty line at some point between ages 25 and 75, I'd say that is a significant amount of people whose best interests the Reps do not represent, making the minority even smaller. While I don't think Democrats are perfect, I do believe they serve the best interest of the nation as a whole, whereas Reps have the best interest of a few in mind. Romney would not the president of the American people, he would only be the president of a minority, the wealthy. As he himself said it's not job his job to worry about 47% of the Americans, doesn't really sound like the president of a whole nation. Obama on the other hand is a president of the entire nation and I'm very proud that Americans made such a choice in 2008 and I feel privileged that I was there to witness it. I'm interested in seeing what choice Americans will make this year. As stated previously, I would vote for the Democrats, since they bring equality, and I'm a very pro-equality person, whereas Reps would only bring inequality (economically and otherwise) with their policies. I will never be convinced that some of us are not entitled to the same rights as others based on for example our gender, birth place or sexual orientation. We are all created equal." Ja sama mielipide patee edelleen, jos vain paivittaa ehdokkaiden nimet. Presidentti Obamasta olen edelleen ylpea. Tana vaalivuonna tulokset koskettavat itseani edellista henkilokohtaisemmin erityisesti maahanmuuttajana ja naisena. Pelonsekaisin tunnelmin odottelen huomista vaalitulosta. Terveysongelmien vuoksi blogi on taas ollut hunningolla, yritan jaksella jatkaa Random Tuesdaysia huomenna. Ei kylla auta naihin verenpaineongelmiin yhtaan huomiset vaalit :D niin jannittavia aikoja elelemme.